Looks like Sebago Lake ..... Don't think it ever freezes completely being so deep? Found a hole big enough for the boat. Used Steve's boat today he wanted to winterize it That evinrude is pretty cool the way it does it automatically. The fishing was great and it was awesome to get on the water .....I was starting to get the shakes....Catching not so good. Steve was washing the boat when I left him getting an appreciation for just how trashed towing in the winter gets a boat. We usually take mine. Glad to see you got out there, Eric! No chance of it here, with the ice we've got right now. We'll see how the next couple of weeks go. Hope for an early spring? Went by Chapmans today and it did look wide open! Well, this current wave of very cold weather has everything iced over 100% again! But on the bright side, the days are getting longer! It's no longer dark at 4:45 PM! yes days are getting longer!! and the fishing equip is slowly arriving, half my reels are cleaned and lubed, tackle cleaned out and organized. Next is get the boat in the garage, install new fish finder and recess the trolling motor foot pedal, its all slowly coming to gether. So I'm assuming that you got a new boat? What did you end up with after the whole warranty fiasco? Show some pictures! I am installing a DSI 7 and am buying a kit to recess the foot pedal. Glad to hear they took care of it for you. That's what they should have done a long time ago! Stopped by Chapman's Pond yesterday just to take a look. 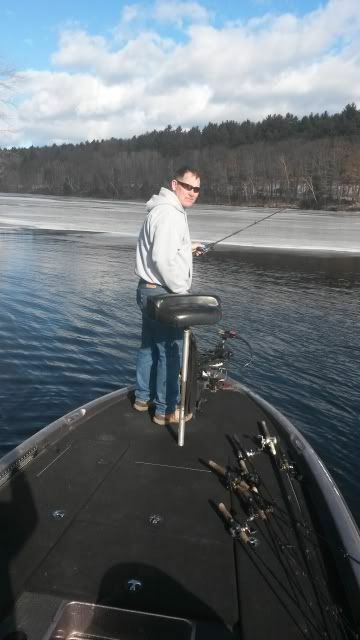 There were a few guys on the ice, right next to the boat ramp. Another Hawg Forum member happened to be there talking to them and stopped at my truck to chat. He said that the ice was 4 inches thick, which surprised me in light of the very cold nights and days we've had. I really though it would be thicker, but then again it was wide open last week. I sat there watching and then talking for at least 20 minutes but didn't see a single flag go up. I was told that they had caught just one bass at that point. With the temps coming up this week, it definitely won't be thawing out anytime soon! Chapmans can be a really slow pond for ice fishing action. Big fish potential but slow on the numbers!